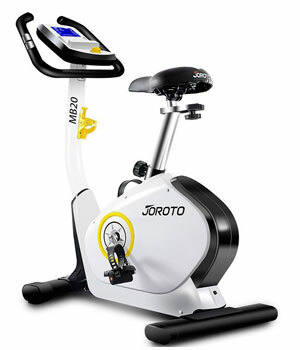 The JOROTO MB20 upright bike is in the same specs range as the Kettler Axos M-LA; however, as opposed to the Kettler model, it is equipped with a motorized magnetic resistance system with 32 levels. Its console also has several preset workout programs. It’s not a commercial grade bike, but for home use, it should be more than sufficient for a range of light to medium cardio exercing routines. The JOROTO MB20 features a frame construction which combines steel with ABS elements. The main frame of the bike is made of thick steel tubing, all the steel parts being double coated with a corrosion resistant paint. The seat bar, however, has a chrome finish. The colors used for the frame are white for the console mast and black for the base frame. The ABS parts are mainly the covers of the flywheel and other internal parts. Their role is protective and cosmetic, and do not reduce the bike’s overall sturdiness. The trainer is rated for a maximum weight capacity of 250 lbs (113 kg). The bike’s stability is enhanced by the adjustable levelers on the rear base. The front base rests on two non-adjustable rubber pads which also improve its grip on the floor. Also, the front base is equipped with two transport wheels which facilitate the unit’s relocation. But nonetheless, this JOROTO exercise bike is far from being heavy. Its assembled weight is only ~57 lbs (25.8 kg), so its transport and assembly shouldn’t be a problem for only one user. In terms of size, this trainer is not extremely large. It’s approx. 40″ long (101 cm) and 20″ wide (51 cm), while its highest point is given by the handlebars which stand at approx. 50″ (128 cm) above floor level. These being said, the bike should fit pretty well even into a smaller room or apartment. However, it is recommended to leave at least two feet of clearance on each side of it for easy access and safe operation. The unit’s frame doesn’t have a step-through design. The access to the seat is far from being difficult, though. The main plus with regards to the bike’s seat is its 4-way adjustability (up, down, front, back). Many exercise bikes, such as the Schwinn Airdyne AD2 or the Life Fitness C1, don’t offer this feature. Its upright post offers several adjustment positions, while the horizontal slider allows several inches of fore-aft travel. Therefore, the bike can accommodate users between 5’0″ and 6’3″ (152 – 190 cm). The saddle included with the bike is considerably wider than for other models. It integrates a layer of foam padding for optimal comfort, and also has a contoured surface. Plus, its connection mechanism to the adjustment bar is standard. Therefore, you can easily replace it with a model that offers more cushioning if it’s the case. Also, due to the standard connection system, it can be slightly tilted forward or backward if necessary. The bike is equipped with a non-adjustable handlebar. It features a multi-grip design, being covered by a layer of rubber foam material in order to provide a secure grip. Its side grips integrate pulse sensors, so the console can track your pulse if you hold on to them. The JOROTO MB20 is equipped with a 14.5 lbs (6.5 kg) flywheel which is balanced, in order to provide a smooth feel during the pedaling motion. Although it’s not extremely heavy, it can deliver a fairly consistent momentum. The bike’s transmission is powered by a heavy-duty v-belt. Therefore, the bike’s operation is extremely quiet. Also, as opposed to a chain drive, it doesn’t require lubrication, and the internal vibration is almost inexistent. 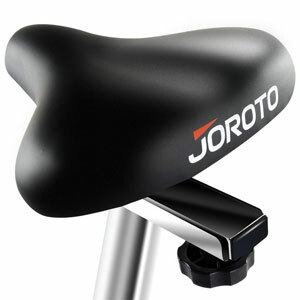 The JOROTO MB20 features a 3-piece durable crank, with solid steel, chromed crank arms. Although they may support users up to 250 lbs (113.3 kg) in complete standing up exercising routines, these types of workouts are not recommended. After all, this is an upright bike, not a spin bike, being designed for seated workouts. The pedals are made of durable nylon material. They feature a non-slip surface and adjustable straps. They’re weighted, so they will always turn face-up when you remove your feet from them. They also have standard threads, so you can easily find compatible replacements for them. In terms of resistance, the JOROTO MB20 integrates an automatic magnetic resistance system. In other words, its resistance system consists of a small motor and a magnetic brake, while the resistance adjustment can only be done from the console. As you select a certain level of resistance, the motor adjusts the position of the brake element in relation to the flywheel. This increases or decreases the intensity of the magnetic field, which results in more or less resistance. The bike makes available an impressive 32-level range of resistance. The first 1-5 levels deliver a very light resistance, perfect for recovery training. Conversely, the 30-32 levels offer the possibility to train on a more intense level, simulating a steep climb. The bike’s console can be compared up to a point to the one of the Sunny ASUNA 4200. It features a multi-panel LCD display with LED backlight. It has a Body Fat function and a Recovery function, and the resistance adjustment is done via a turn-knob rather than Up/Down or +/- controls. 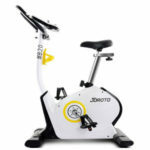 However, as opposed to the Sunny console, the unit on the JOROTO bike offers 12 pre-set workout programs which offer various exercising possibilities to keep you motivated. The unit’s display shows time, distance, speed, calories, and pulse. These workout metrics are shown on its bottom section. The large grid in its mid-section shows the profiles of the program in use. The console unit is not telemetric. It can only read your pulse via the EKG sensors incorporated into the bike’s handlebars. The unit is very easy to operate. The knob in the middle allows you to control the resistance level. By turning it from left to right you can increase the pedal tension level. There is a RESET button which clears all the values to zero and allows you to start fresh. The Start / Stop button allows you to pause and resume your workout, which is great if you alternate cycling sessions with other types of workouts. The Recovery button covers the unit’s recovery function. This feature gives you the possibility to measure your level of fitness at the end of the workout. The console will analyze the time it takes for your pulse to come to normal after the workout and provides you with a fitness rating between F1 (Excellent) – F6 (Poor). The Body Fat button covers the BMI function. It uses a scale to measure if you have a healthy weight for your height. In order to calculate it, the console will prompt you to input your weight and height. Last but not least, the bike’s console integrates a tablet holder which is placed under the unit’s display. It can accommodate any type of tablet. However, the unit doesn’t have a USB port to dock your tablet for recharging. It also doesn’t have online connectivity features or Bluetooth. Most of the bike comes pre-assembled. Its main body along with the internal parts are already in one piece. All you have to do is attach the console mast, the seat with its post, the base bars, the handlebars, the console and the pedals. This may take up to an hour. A basic toolkit for the assembly is included. Also, the manual provides clear assembly instructions and schematics. Maintenance doesn’t require much. All you need to do is keep the dust off the bike, check if the bolts hold tight in their place, re-tighten them if it’s the case, and keep liquids away from the console. A tablet placed on the tablet holder may cover most of the console display. 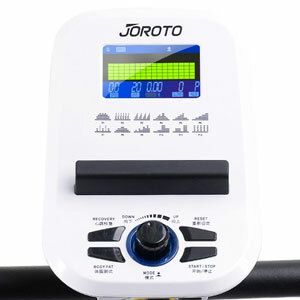 The JOROTO MB20 is a mid-range upright exercise bike, featuring a motorized magnetic resistance, with 32 distinctive tension levels. It has a weight capacity of 250 lbs. Its console offers 12 preset workouts, and the possibility to create your own custom workout. 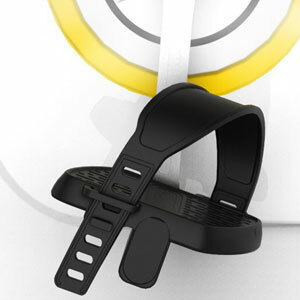 It also has goal tracking, a recovery function, and a BMI function. It’s a bike perfect for users of all levels, great for light to medium cardio training, interval workouts, and weight loss. In all, it offers an excellent value for the price.